The aim of Dexeus Woman’s Health (DEXEUS) is to provide care for women’s health in all stages of life as well as a comprehensive and efficient response to her needs. DEXEUS has been designed to include all obstetric and gynaecological services with a personalised attention to patients. The DEXEUS Department of Obstetrics, Gynaecology and Reproduction has 60 doctors, 20 biologists and 14 technicians, committed to offer high quality medical treatment using the most advanced medical techniques available. DEXEUS is a university institute that has medical internal resident trainees to become specialists in Obstetrics and Gynaecology. Of special relevance for this project are the Gynaecological Oncology Unit and the Genomics and Personalized Medicine Unit. Genetics counselling and personalized clinical care is provided to patients for, reproduction and cancer evaluation. DEXEUS has been a pioneer in development of a gynaecological check-up program performing over 55,000 check-ups every year, and over 30,000 are screened for cancer. Research at DEXEUS is currently organized in three departments, led by outstanding clinicians and scientists, organizing the clinical research activities of the institute. The Genomics and Predictive Medicine Unit of DEXEUS is leading translational genomic activities of the institute in the fields of fertility, cancer prevention, and obstetrics. The unit has initiated activities in cancer prevention that involves the genomics characterization of a panel of gens to detect the highly penetrant variants that lead to cancer, and other programs on carrier screening and fertility testing. The Unit has a strong component of genetic counseling as a core clinical activity in all aspects of genetics, genomics and genetic testing. Ana Abulí leads the genetic counseling activities at DEXEUS, with strong links with the training Master in Genetic Counseling organized by the Pompeu Fabra University, being recognized as one of the best training activities in genetic counseling in Europe. WP4: P2 will participate the clinical validation in cancer patients and in patients with high and low risk of breast cancer. P2 will coordinate all activities of genetic counseling and will test the feasibility of the bioinformatics tools that will be developed in WP1 to WP3 to evaluate genes and variants involved in cancer risk. P2 will set up the stage for the clinical translation of PanCanRisk and the connection with patients, at the level of social, personal and clinical perception of cancer predisposition testing in the new scenario of genomics knowledge. Anna Abulí has extensive experience in genetic counseling of cancer and in the genetic characterisation of colon cancer. She leads the genetic counseling unit at DEXEUS in the framework of a personalised medical genomics program that will bring translational activities of genetics and genomics to the clinical setting of woman’s health. 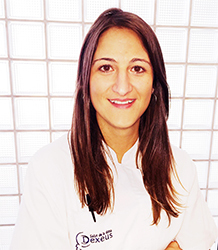 Anna Abulí (female, PhD), Specialist in Genetic Counselling and responsible for the genetic counselling at DEXEUS. She has participated in several projects to evaluate the genetic c to colon cancer and has contributed to several international consortia to study cancer risk. Maite Cusidó (female, MD), leads the women’s cancer clinical genetic screening program at DEXEUS. She will participate in the clinical selection of patients with high risk of cancer that will be evaluated in the PanCanRisk project. Rafael Fábregas (male, MD), Head of the Cancer Gynaecology Section at DEXEUS. He will contribute to select breast cancer high risk and low risk patients for characterization with the targeted resequencing approaches proposed in PanCanRisk. One experienced posdoc will be paid entirely with the EC budget. Whissell G et The transcription factor GATA6 enables self-renewal of colon adenoma stem cells by repressing BMP gene expression. Nat Cell Biol. 2014 Jul;16(7):695-707. Abulí A, et The MLH1 c.1852_1853delinsGC (p.K618A) variant in colorectal cancer: genetic association study in 18,723 individuals. PLoS One. 2014 Apr 17;9(4):e95022. Dunlop MG, et Cumulative impact of common genetic variants and other risk factors on colorectal cancer risk in 42,103 individuals. Gut. 2013; 62: 871-81. Castellví-Bel S, Abulí A, Castells Meta-analysis of several GWAS sets yields additional genetic susceptibility variants for colorectal cancer: first X-linked component identified. Gastroenterology. 2012; 143: 1684-5. Abulí A, et al; Gastrointestinal Oncology Group of the Spanish Gastroenterological A two-phase case-control study for colorectal cancer genetic susceptibility: candidate genes from chromosomal regions 9q22 and 3q22. Br J Cancer. 2011; 105: 870-5. Anna Abulí has participated in many national and international consortia to evaluate cancer risk genes and mutations. Some of these consortia are the Gastrointestinal Oncology Group of the Spanish Gastroenterological Association; and the EPICOLON Consortium. In addition the PI has implemented a NGS carrier screening that contains over 200 genes (qCarrier test, http://www.qgenomics.com/) for couples that are treated in infertility programs, developing good practice guidelines for genetics counselling. Similarly, a test for cancer risk analysis (qCanceRisk), containing the highly penetrant genes is now being implemented at DEXEUS. P2 participates in several research projects to translate genomic knowledge into clinical applications, in particular in the field of benign tumours of breast and uterus, and in endometriosis characterisation of the genetic and genomics architecture. The Genomics and Personalized Medicine Unit was created in 2013 to develop clinical services in genomics medicine in he fields of Obstetrics, Gynaecology and Reproduction in DEXEUS. The program is developing activities in carrier screening for genetic disorders in couples that are treated in the fertility clinic, prenatal diagnosis and cancer genetic studies in women at risk of several cancer types. As part of this activity, the DEXEUS Genomics and Personalized Medicine Unit has developed a genetics next generation sequencing (NGS) panel that covers 215 genes involved in high risk for cancer. This panel is being applied in the clinical setting with very strict protocols for genetic counselling in women of high risk of different cancer types, particularly breast and ovarian cancer.